Joe Masiello, C.S.C.S. and co-owner of Focus Integrated Fitness in New York City, is one of the creators of PT6, a high-intensity interval training workout that hits the six major components of an exercise program you need to get in shape—fast: cardio, core, and upper- and lower-body pushing and pulling. Translation? It’s going to get you looking good. Bam—beach parties here you come! 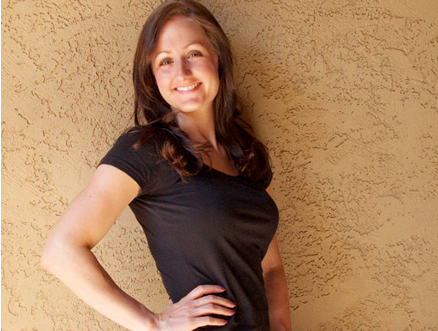 Kate Burggraf, personal trainer and PT6 instructor, will take you through the moves. Exercises: Do each of the six exercises for 45 seconds. Take a 45-second rest before you move on to the next. Go through the circuit twice. Results: Do this workout three times a week and, according to Masiello, you’ll start feeling stronger after the first few sessions, and you’ll start seeing inches and weight drop in four to six weeks. • Stand with arms straight out in front of you, parallel to the ground, palms facing down. • Keeping your leg straight, raise it toward your hands. • Your foot should return to the floor in front of you so you can step forward and repeat with the other leg, walking across the floor. • Stand with your arms at your side, elbows bent 90 degrees. • Raise your left knee above your hip. • Quickly lower and repeat, alternating legs. • Stand in a squat position (knees slightly bent, feet shoulder-width apart) with your arms at your side, elbows bent 90 degrees. • Raise your left foot off the ground about two inches. • Quickly lower and repeat, alternating feet. • Lie on your back with your knees bent and feet resting on an exercise ball (you can also use the edge of a bench or chair). • Raise your hips off the ground. Try to lift hips so they are in a straight line with your shoulders and knees. • Stand upright holding 8- or 10-pound dumbbells at shoulder height, elbows bent and palms facing in. • Bend hips and knees, lowering into a squat. Keep dumbbells at shoulder height. • Stand up out of the squat and press the dumbbells overhead, fully extending arms so there is only a slight bend in the elbows at the top of the movement. 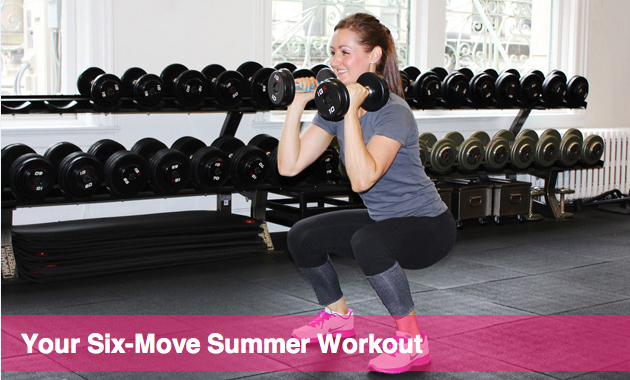 • Bring dumbbells to starting position and repeat. • Get in push-up position (make sure that hips are in line with shoulders and that feet are shoulder-width apart), and go down for a push-up. • When you return to the top position, lift your left hand off the floor and touch your right shoulder. Return left hand to floor and repeat with right. • Perform another push-up and repeat steps above. • Stand with your feet slightly wider than hip-width apart, lean forward, and place one hand on a chair with your arm completely straight. • Maintain a neutral spine (no rounded back) and a tight core. • Hold an 8- or 10-pound weight in your opposite hand with arm hanging straight down (weight should be lower than edge of chair). • Pull the weight up by bending your elbow. Lower weight back down and repeat 12 times on the same side. • Alternate sides after every 12 reps until the 45 seconds are up. 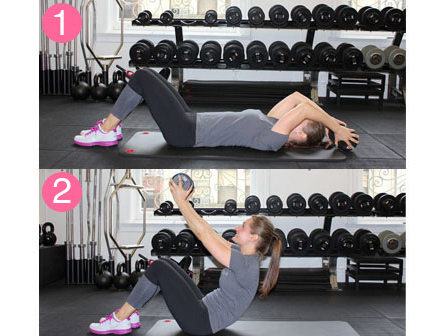 • Lie on back with knees bent and hold a dumbbell overhead, one hand on each end of the dumbbell. • Raise the dumbbell up over chest and lift head and shoulders off floor into a crunch. Arms should remain straight (elbows should not bend). • Start in the push-up position. • Bring both knees in to your chest in a jumping motion while keeping your hands on floor. • Come to an upright position and jump into the air, reaching your arms overhead. • Return to push-up position and repeat as quickly as possible.